On Thursday, September 18, 2014, community leaders and champions joined with Central Kentucky Community Foundation to celebrate the impact philanthropy plays in our communities. CKCF works with many “forever” investments in the community. Check out this video which shows some local children trying to define forever. Over the years, this foundation, through its work as North Central Education Foundation, undertook endeavors that fit some of the definitions of forever shared by children in the video. Elizabethtown Community and Technical College, a community recreation area at the University Drive Park, a new home for the Hardin County Public Library and a new opportunity for high school students – the Early College and Career Center -EC3. This year CKCF was proud to announce some new forever investments in the community. The Dr. Jim Owen Scholarship celebrates the life and forever value created by the first president of Elizabethtown Community College. Dr. Owen’s leadership attracted and developed a high caliber faculty committed to delivering a quality higher education experience for students and high quality graduates for the community. He was deeply devoted to the betterment of the community serving as a civic leader in numerous community initiatives and an active Rotarian. The Dr. Jim Owen Scholarship was established by his wife, Nancy Lea, and his children to continue to impact education for students in this region. The scholarship will be based on academic achievement, financial circumstances, and community service. 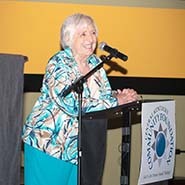 Dr. Linda Mayhew was the first faculty member hired at Elizabethtown Community College. Over the past five decades, students have entered and exited Dr. Linda Mayhew’s classroom, but none have escaped the caring experiences of Linda’s instruction that lasts a lifetime. She connects with, believes in, encourages and supports her students in a manner only Linda is capable. Her students’ success brings Linda great joy. Linda’s impact and influence on her students’ live on in shared memories. Over the years, the foundation developed a deep relationship with people who wished to support these types of educational opportunities for successful students needed to grow our region. CKCF, through the generosity of business and individual donors, is pleased to announce the establishment of the Dr. Linda Mayhew STEM Endowed Scholarship. 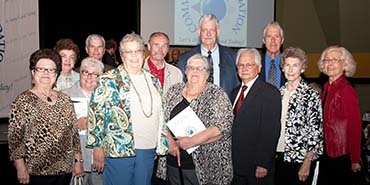 In honor of the 50th anniversary of ECTC this will be a $50,000 endowment. It is the desire of these donors for this money to be used as match to grow the fund to $100,000. These scholarship funds are gifts of opportunity to people in this region –the opportunity for education and to continue to take advantage of the first Forever investment made by CKCF over 50 years ago when we established Elizabethtown Community and Technical College. Heels Together is led by community spirited women and funded by people who value and want to be part of women-led solutions for women and girls. We have an opportunity to focus on women-led solutions by providing leadership and stewardship in identifying the needs and supporting solutions. Together, we can unite money, ideas and actions to create lasting change for women and girls, their families and our community. Heels Together will consist of an endowment to provide for the forever impact of Heels Together and a grant-making component to put our beliefs and desires for women and girls in our community into action today. CKCF offers many ways for you to support your community’s development, initiatives, organizations and causes through various types of funds and planned giving – giving today to impact forever. If you are interested in how you can be part of these opportunities to invest in our community, please contact us at 270-737-8393 or info@ckcf4people.org.